Just another easy card for you to enjoy! Here I ran a piece of transparency through my Cuttlebug with an embossing folder, it was so fun! Except I couldn't tell which side was the front afterwards, not that it matters! I adhered it at the top of the card base, then tied a ribbon to hide the adhesive. The olive circle is adhered to the back of the transparency to hide the adhesive of the flower and sentiment. You gotta try the transparency-in-the-CB trick! This card is so stunning, but really so simple!! WOW!! I'm definately going to put a piece of transparency thru my CB, so clever!! I will have to try this, too! That looks so cool, Becky. Can't wait to try it!! Don't you just love running acetate through the CB? I did a ton of them for Christmas this year. 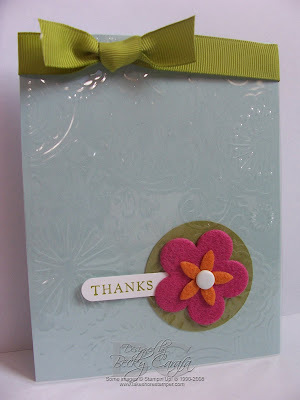 Your card is super cute - the embossing gives it great dimension! Wow Becky! How cool is that? What an awesome idea. Too bad I don't have a CB or I'd be trying it now =). Beautiful card! TFS! great idea! very pretty card! Oooooo, this card looks so cool! Yep, I'll have to try that, too. Becky - love this technique and such a great card. It's amazing how much transparencies can add to a card - TFS!